The Cowan Report: Turmaine Landslide! Please indulge me while I report that Matt Turmaine has been elected to represent the residents of Holywell, West Watford securing a fantastic 62% share of the vote. Previously a resident of Hammersmith and Fulham, Matt has long been an active and truly hardworking campaigner. He is also a thoroughly decent bloke. Sadly for us in H&F Labour, Matt and his wife moved to Watford quite a while ago but that was good news for them and (if I may say so) has also turned out to be good news for the people he now represents. He will work hard for them and do them proud. 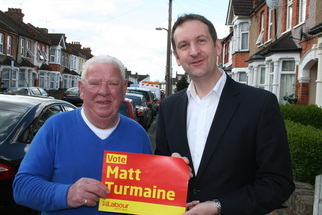 Well done to the newly elected Councillor Matt Turmaine and to all his Watford Labour colleagues.